“Welcome home!” That was the first thing Susan Rabinowicz, director of the Young Israel of Forest Hills Senior League, said to us when we arrived for our recruitment event on Tuesday. The center will be our second home starting next Monday as Sherry Teitlebaum and I will be co-facilitating a two-week theater project with older adults, culminating in a free performance at the center on Thursday, August 9th at 1 p.m. The project is called Our Play’s the Thing. Sherry and I were at the center on Tuesday to personally introduce the project to prospective participants. First, we visited an exercise class to give a short presentation about what the project would entail. We explained that people in the project would be creating and performing an original play inspired by a physical object such as keys, flowers, or shoes. Then we went to the lunch room to speak about the class to other members at the center. 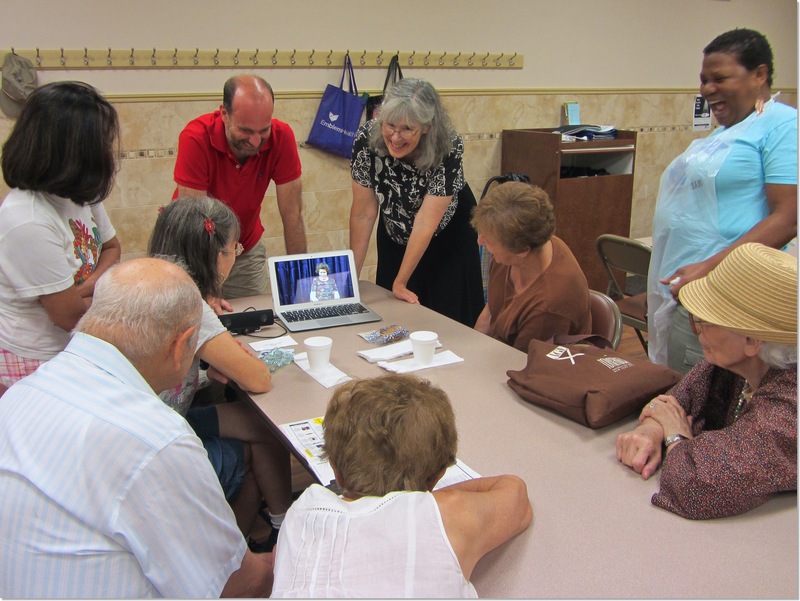 Next we showed our crowd funding campaign video to a few small groups of seniors. They smiled and laughed when they saw our interviews with Susan and other members from the center. Finally we sat down and chatted about the programs with individual folks over lunch served by the center: baked tilapia. I had a wonderful time meeting and talking with older adults from the center. I sat in on a card game, heard a wonderful love song about a rooster, and caught up with some of the women we interviewed for our video. I am very excited about the start of Our Play’s the Thing. If you want to follow the project, check back to this blog for updates. On with the show! This project is made possible in part with funds from the Decentralization Program, a regrant program of the New York State Council on the Arts, administered by the Queens Council on the Arts. Funded under contract with the New York City Department for the Aging. Additional support provided by Everybody Act! Theater in Education & Communities. Susan Rabinowicz has been running the Young Israel of Forest Hills Senior League for twenty-three years. A spunky, down to earth, practical woman with an infectious laugh, she has steered her senior center through the ups and downs of funding crises and managed a major renovation that increased accessibility to its services. She has been there for her constituents as they negotiated the daily challenges of living on a fixed income in a changing neighborhood. But next week, Susan is embracing a new challenge. She is partnering with Everybody Act! to offer Our Play’s the Thing to Queens’s older adults, age sixty and up, who want to create an original play through storytelling, improvisation and theater games. Up to fifteen older adults may register for the free playbuilding program, which runs from July 30 through August 10 at the Young Israel of Forest Hills Senior League, located at 68-07 Burns Street in Forest Hills. Workshops take place from 12:45 to 2:45 PM, Mondays through Thursdays and on Fridays from 12 – 1:30 PM. On Thursday, August 9 at 1:00 PM, the group will perform the short play they created in the Senior League’s multi-purpose common room. The performance is open to the public and free of charge. No reservations are necessary. 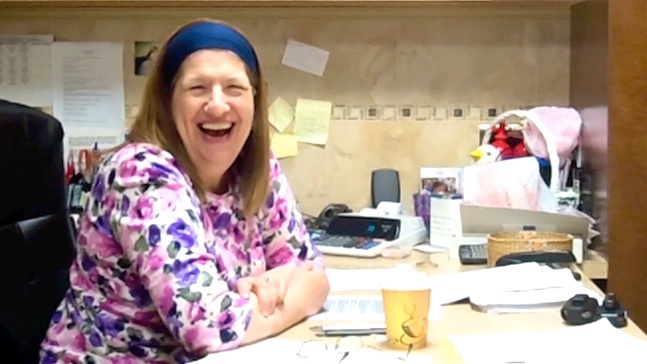 With Susan’s strong hand at the engine throttle, the Young Israel of Forest Hills Senior League has become the little senior center that could. It is chug-a-lugging into a future where its constituents will become active creators of culture. For more information or to register, contact Susan Rabinowicz, 718-520-2305, foresthillsseniorctr@nyc.rr.com. The project is made possible in part with funds from the Decentralization Program, a regrant program of the New York State Council on the Arts, administered by the Queens Council on the Arts. Funded under contract with the New York City Department for the Aging. Additional support provided by Everybody Act! Theater in Education & Communities.